This weekend I went to Vermont for a joyous reason: the wedding of a dear friend! It was my first trip to Vermont and it was a very quick turnaround but I had a really good time. Friday I flew into Boston and picked up my rental car. Getting out of Boston was a traffic-ridden nightmare but, once I escaped, it was smooth sailing through New Hampshire all the way to East Burke, Vermont. Although Boston traffic delayed my arrival, I still made it in time for the rehearsal dinner - and thank goodness for that! The Fijian side of the bride's family guided guests through a kava ceremony, in which we ground up kava root, mixed it with water, and drank it from coconut shells. I was exhausted from a day of travel but the kava - supposedly a sedative - actually perked me right up! Saturday morning I went out seeking a trail run. Nearby Lake Willoughby is known as the Lake Lucerne of North America so I had to see it. Lake Willoughby sits at the foot of Mt. Pisgah, so I decided to do a quick trail run before taking a dip in the lake. The trail to Mt. Pisgah's south lookout (where there should be a gorgeous view of the entire lake) was less than two miles long so I figured it would be a half hour out and back. Oh, how wrong I was! 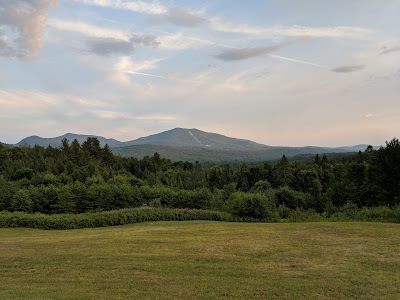 Vermont's mountains, it turns out, are quite a bit steeper than the gentle foothills to which I am accustomed so very quickly my trail run turned into a hike. Some parts became quite technical too such that I was actually scrabbling on all fours. 45 minutes later I finally reached the south lookout - which was completely enveloped in fog so there was no view at all! It was a great workout, though, and coming down was just about as hard as going up. After an hour and a half I made it back to my car - and no time for a dip in the lake as I needed to meet Oliver back at my hotel! The entire time on the trail I kept passing people who were speaking French, which instigated two reactions from me: 1. why on Earth are so many French people in Vermont?? 2. My French must be getting really bad because I can barely understand them! It wasn't until I paused at the top (possibly causing bloodflow to return to my brain) that I realized that, duh, they weren't French; they were Canadian! We were only a half hour drive from the Canadian border. My hotel, the Burke Mountain Resort, sits at the foot of a network of ski slopes. In recent years, however, there hasn't been much snow, so the area has pivoted to become a haven for mountain biking. Oliver met me at the hotel to hike up the slopes for some spectacular views. After my unexpectedly strenuous morning hike, though, I needed to refuel a bit first so we stopped by the hotel pub. Motivated by proximity to Canada, I tried poutine for the first time. I ordered a Vermont cheese board to boot, keeping the entire meal local[ish]. With full bellies we we set out onto the slopes. With no real plan we simply worked our way up. Sometimes we were on road, sometimes on forested single track trail, and sometimes out on grassy slopes; it was beautiful! An Ironman was being held that same day and my hat is off to the competitors; a normal Ironman is already impressive but running up and down those steep slopes (after so much swimming and biking) was positively insane! Oliver and I stumbled our ways back down the slopes and hurriedly got ready for the wedding. I wore a bowtie for the first time in a non-formal setting, which was fun. The wedding was outdoors at the groom's family farm. It threatened to rain but never quite did so; accordingly, the weather was truly pleasant while we celebrated my dear friend and her new husband. I bumped into a former colleague there too, but I spent most of my time meeting friends and family of the bride and groom. Everyone was really lovely (There was even a golden retriever named Max!) and I'm sorry I had to leave early. Leave early I did, though, as I had an early wakeup call to drive back to Boston and catch the first flight back to RDU. As much fun as I was having in Vermont, I was quite keen to return to Katie and our baby. My first experience in Vermont was a very positive one. It certainly lived up to its reputation as the Green Mountain State and I can't wait to return and enjoy more of its nature and hospitality!